On this one of a kind family friendly excursion, you will be the first to experience the best of Ocho Rios from Falmouth. 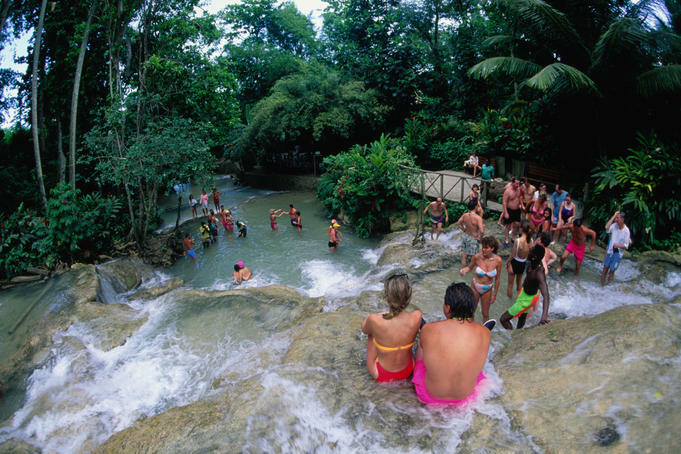 After a very informative Falmouth and Discovery Bay history lesson, next stop is Dunns River Falls; a refreshing spot where generations of visitors have been thrilled by the guided 600 ft. climb up the falls. For those of you who are a little more adventurous and looking for a challenge, climb on your own up the rugged right side of the falls. If you prefer to meander to the top of the falls without getting wet, there is a staircase right next to the falls. For those of you who prefer a more sedate visit, there is an inviting beach at the base of the Falls where the river and ocean meet. Next stop, after a scenic 15 minute drive, is the famous White River. On your journey to this inviting river you will have the opportunity to view "behind the scenes" Jamaica while touring the local neighborhoods of Ocho Rios. Upon arrival at White River, you will find a changing area, life jackets, and a shop. The thrills begin when you plop down into a tube outfitted with a bottom to begin your breathtaking journey through rushing rapids and placid pools as you continue to drift along the White River which takes approximately 45 minutes. Midway through this aquatic adventure you will have an opportunity to take a breathtaking 20 feet plunge into the deep blue river water while having your photo taken by a member of the attentive White River Tubing staff. If this is too much adventure for one day, there is a bar nearby where one can enjoy a frosty Red Stripe and relax beside the water. We had a wonderful time and our driver/tour guide was excellent. Thank you for providing us with such a great tour! The tour went well and we are very happy with our tours. We would recommend. We had looked forward to seeing the falls, and it didn’t disappoint us at all. Everything went absolutely well! We had an AMAZING experience with the River Tubing and Dunns River Falls excursion. Our driver, Michael, was honestly wonderful. He was so nice and accommodating, and helped us have the best time. He was really helpful and taught us all quite a bit about the island as well. Would highly recommend him for tours! Our river tubing experience was wonderful-- everyone agreed it was their favorite part of the entire trip. Our guides there were fantastic as well. Dunn's River Falls was also great-- it was beautiful and we had a great time. The trip was topped off by a stop at Scotchies for the best jerk chicken we've ever had. Definitely would use Jaital again in the future for excursions. The trip went very well. We were happy at how things turned out. Dunns River Falls was a terrific experience. Our driver, Dewayne Jones, was friendly, professional, a delight to spend the day with. The heavy rain prevented us for doing the river rafting, but we had a wonderful time anyway. We would recommend Jaital and use your company for our next visit to Jamaica. It was amazing. We would recommend you guys to anyone traveling to Jamaica!! We had great time and a very great day with our driver in Falmouth. I truly recommend this excursion. It was great! Brian our driver was the best part of our entire vacation. He is awesome! He told us about the area in great detail, took us to the best places to eat twice, and treated us amazing!! We LOVED our experience. We especially loved our driver-Brian. He was sooo fun and knowledgeable. Thanks for everything! We had such a great time on the River Tubing and Dunns River Falls trip! It was perfect for our children (ages 8,5,4). T-Rob was a great tour guide! had Mario as my driver I believe. He drove us both trips we booked with you all. I would highly recommend him to anyone I know. He provided excellent customer service, very friendly , was there when we were ready to move from destination to destination and just great all around. He made sure we also knew about different Parishes and told us a lot of history about Jamaica. I will definitely be booking with Jaital on any other island vacation I go to that Jaital offers tours on. Thanks for the excellent service. Our experience was FABULOUS!!! 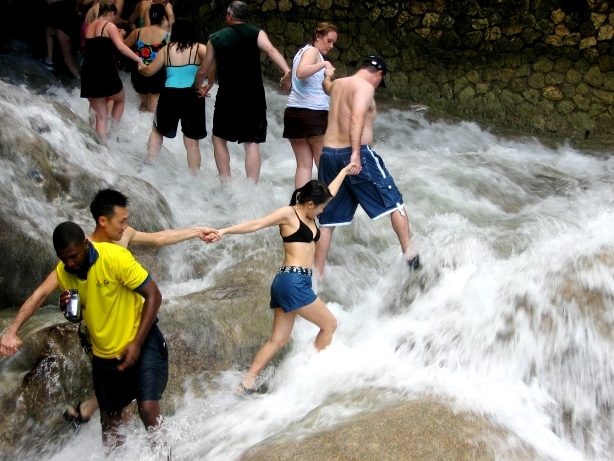 Dunns River Falls was beautiful and fun to climb up. Our driver, Bradford, was funny and kept us entertained. It was a good visit to Jamaica. Next time I would love to go and visit with kids that are in school and help with that. I really enjoyed our experience. Everything was fantastic. Vernon our driver was very informative and helpful. We had a fabulous time! When we come back to Jamaica we will definitely choose you again Our driver Bradford was extremely knowledgeable and made our drive that day much more pleasant We will definitely ask for him again We will be passing your name on to friends Thank You for the wonderful experience!!! Our driver gave us exceptional service. We enjoyed the day with him. He made it a better experience. Also, we loved Dunn’s River Falls. Can't thank you enough!! Our driver was so good! Very helpful, very informative, filled us in on alot about the island as we drove through it. We could relax so much with him, he was great fun, my 9 year old loved him!! He got us everywhere we wanted , waited and back to our port in plenty of time! We thoroughly enjoyed Jamaica ! Will definitely be recommending ye to my family and friends! We loved this excursion from start to finish and highly recommend it! With our party of 4, we had a private tour driver in our own van the entire day. Our driver was exceptionally friendly and knowledgeable of the area. He provided superior service throughout the excursion. Dunn’s Falls is a must if you’ve not done it before. A bit crowded, but an experience worth doing. When you get to the area, be aware that you can skip the line for joining a tour group and do it yourself. It’s the way to go. 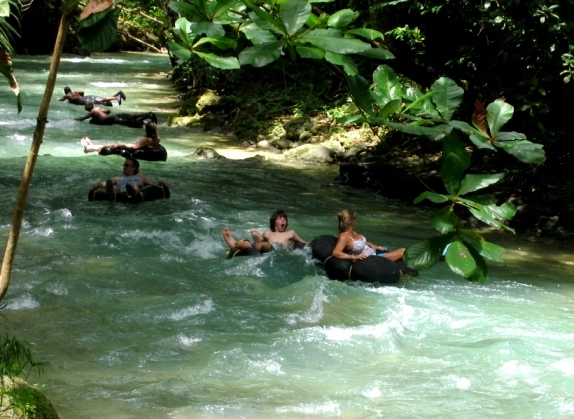 Then the River Tubing is even better, it’s an amazing experience and a fun glimpse of life in Jamaica. We thoroughly enjoyed both stops and highly recommend this excursion. Thank you Jaital! We had an amazing time in Jamaica and are very thankful to Jaital for being on hand to ensure that our day went smoothly. Our driver/guide, Jeremy, informed us about the current situation and what has been developing in Jamaica over the past years. The Falls were so incredible and, although Big Daddy, the one who led us up the Falls, did not seem very attentive or helpful, there was a gentleman in our group who helped everyone and made sure the group stuck together and had a successful climb. I have never actually climbed up a waterfall before and the experience blew me away! We were next taken tubing and Jeremy continued to tell us about the area and the people who live here. I enjoyed seeing the different types of neighborhoods on this section of the journey. Our tubing guides (three men and a teenager) were absolutely outstanding! They were constantly ensuring that the group they were in charge of stayed together, they were fun and made jokes, and they sang a lot of songs, encouraging everyone to sing along with them. The tubing itself, in a cold river coming down from the cold water mountain rivers and lakes, was exhilarating with smoother areas offset by short rapids. Loved this! Jeremy came to pick us up (we waited about 10 minutes for him, I think he went to get his lunch) to take us to a shopping area, where we were able to get our souvenirs. Thanks, Jaital, for making our Jamaica stay so pleasant, adventurous, secure (it was so easy to leave all of our valuables in the security of Jeremy's van) and easy, while also being so reasonably priced. Was all very nice and good driver and the guide was great also..
Our Trip was great. Fiesta (the driver) went above and beyond to make sure we were safe and having fun. He even made us and our children bracelets while he waited at the falls. "An experience like no other!" We enjoyed our tour very much. Our driver was pleasant and drove safely. We had no issues on the tour at all. We would recommend Jaital to others. e were a party of four adults who took the River tubing and Dunn’s River Falls excursion on December 24, 2015 and had a marvelous time! The driver was professional and courteous plus his vehicle was immaculately clean. He had a wonderful sense of humor and filled us in on a lot of local history. The river tubing was very fun as the local guides serenaded us with songs as we floated down the river. We took advantage of the ability to jump off the high platform at the midway stop. It was tons of fun! 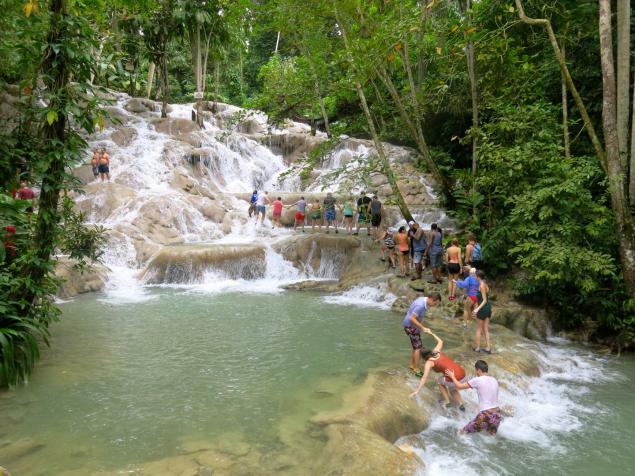 The Dunn’s River Falls are an amazing site to behold! What natural beauty! It was quite crowded when we arrived but we still were able to make the climb and have time to get back to our ship without rushing. I wish we would’ve started our tour earlier than the 9:30 departure as I loved Jamaica and it’s people and wanted to spend as much time as possible off the ship enjoying the local culture. I would definitely recommend this tour and company for this excursion. Kudos on a job well done! Everything was great and went exactly as planed. Would book again with you anytime. Our experience was wonderful. Our guide was waiting for us when we got off the ship. We boarded the van and received a private tour for our party of 7. Our guide first took us to river tubing and told us interesting facts about Jamaica along the way. Tubing was awesome. The area was beautiful. The water was clean and clear. The rapids were exciting. We stopped half way and took turns jumping off the bridge into the water. The kids loved it! Our guide met us at the end of tubing and took us to the Dunns River Falls. That was a great experience. If we hadn’t been pressed for time, we would have loved to climb the falls a second time. Our guide then returned us to our ship (on time! J). Thanks for everything. We enjoyed an amazing day in Jamaica! This was the second time we used your company. Everything was great. Our guide Errol was awesome!!! He made the experience even better! We had a great time, great service, very enjoy our day. Avons passÃ© une excellente journÃ©e, beaucoup apprÃ©ciÃ© la descente en tube avec les enfants. La montÃ©e des chutes, un peu plus ardu. Nous sommes trÃ©s contents de notre tour. It was an amazing experience and our chauffer, Jeffery, went above and beyond in showing us Jamaica and giving us a brief history of the island culture. We would most definitely utilize Jaital in the future and will recommend you to our friends as well. Yes we were quite satisfied with the excursion we booked: River Tubing and Dunns River Falls Satisfied with your website: details about the excursions and quick answers to our questions. Satisfied with SHERNON-DOLPHY, a very good guide and driver. He was there on time,so we didn\'t have to wait at the entrance of the falls; he gave us as many explanations about Jamaïca as we wanted to have; he was very nice, polite and helpful. He was a bit disappointed when we told him we couldn\'t go and taste jerk chicken, because we were expected on the ship. Really a good guide. This excursion was one of the best moments in our cruise. And I regret not to have booked one of your excursions in the Caimans. It was too late when I discovered the choice you offered, but I could see that it was much cheaper than on the boat! One thing on which you should insist : bathing suit. It wasn\'t a problem at the falls. But we discovered, too late, it was one at the tubing. Though we had our bathing suits under our clothes we didn\'t change thinking we would just have to cope with unimportant little splashing. We didn\'t know that the bottom of the tube let water in. We discovered it when we sat in the tube (a real bath!). Shorts ans T-shirts were drenched. As we didn\'t have other clothes, our guide patiently let us dry a little in the sun (quick drying clothes), and, in the car (a very nice and clean one), we sat on our towel and plastic bags, not to wet the seats. However we did enjoy the tubing, funny and relaxing at the same time, and the very nice young guy who accompanied us on the water (I don\'t rememember his name which sounded somewhat brazilian) was quite OK and sang all the time. Besides going to the starting point made us discover a little of inside Jamaïca. Whenever possible I\'ll recommend your site . Our recent experience with Jaital was wonderful. I was a little nervous in the beginning but Alan quickly resolved any of my questions. Alan was so easy to find off the ship. We couldn\'t have had a kinder, more experienced driver. I had 3 children with me and Alan made sure everyone was ok frequently, he showed us many sites around Jamaica we wouldn\'t have seen on the bus. I would highly recommend Jaital and Alan. I will use them again if I\'m in Jamaica again!!!!! We had a fantastic time. The driver/guide was outstanding. He was informative and very friendly and helpful. The River tubing was a blast. The young man we had as a guide was great. Very protective, very knowledgeable. Will definately research your site again and recommend you if we can. Thanks!!!! Getting off the ship, there were plenty of helpful people available to point us to where the driver was parked. Our driver, Byron was friendly and helpful, we were on our way quickly and we all felt safe and comfortable in the air conditioned van. The drive to Ocho Rios was informative and interesting. All of our belongings were safe in the van as we went on our river ride and Dunns river falls tour. The guides on the river were awesome. Singing, friendly and keeping us safe while we floated down the river. The pictures were an excellent addition to the trip and reasonable prices. The trip on the river was short, too short. As a party of 10, this was our only problem with this experience. Byron watched for us to exit the falls and found us and drove us back in plenty of time to do some local shopping and make the ship on time. Thanks for the memorable experience. We did book our excursion with your company and had a great experience. Our driver, Nicholas, was waiting for us as planned when we disembarked the ship. He was very polite, knowledgeable, and fun! We really enjoyed having our \"own\" tourguide, as opposed to being with tons of other people had we booked the ship\'s excursion. We felt very comfortable with the whole experience and would definitely recommend your company to others.